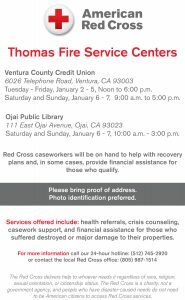 Thomas Fire Service Centers (American Red Cross) will be open at Ojai Public Library (111 East Ojai Avenue, Ojai CA 93023), Saturday and Sunday, January 6-7, from 10 a.m. to 3 p.m. Red Cross caseworkers will be on hand to help with recovery plans, and in some cases, provide financial assistance for those who quality. Please bring proof of address, and photo identification is preferred. Services offered include: health referrals, crisis counseling, casework support, and financial assistance for those who suffered destroyed or major damage to their properties.